A woman has told how her life was saved when a bullet bounced off her bra. Helen Kelly, 25, was hit as shots were fired after last November's Urban Music Awards in Barbican, central London, in what police said was a gang feud. She told BBC News the underwire on her bra deflected a bullet away from her chest and into her right breast. Linton Ambursley, 28, from Lewisham, south-east London, was jailed for 12 years on Friday at the Old Bailey after admitting wounding with intent. 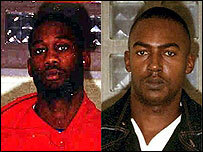 The court heard how the Ghetto Boys from Peckham and rivals from Bermondsey, both in south-east London, fired 18 shots as people left the awards ceremony. Ms Kelly was hit as she and a friend ran for safety. "I heard some bangs but I didn't think it was gun fire," she said. "I started running. Then I looked down and saw blood on my stomach and it was only then I realised I had been shot. "I'm still not sure how it happened, but the underwire on my bra snapped when the bullet hit it and I think it did stop it going any further." Det Sgt John Osibote, from the City of London Police, said: "There was absolute pandemonium. "Members of the public were caught in the cross-fire of two gangs who had the audacity to open fire in the centre of London." Tyrone Headley, 28, from New Cross, south-east London, was jailed for two years at the Old Bailey on Friday for assisting an offender. 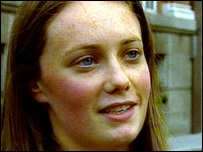 Ms Kelly, an accountant originally from Tyneside, was the only casualty.